It’s the most wonderful time of the year once again! 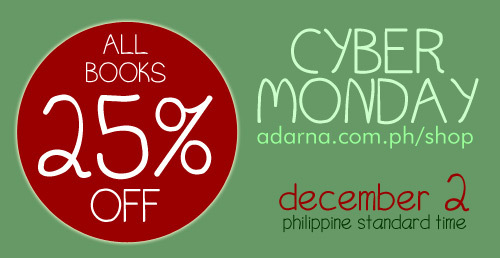 From November 16 to December 19, you can enjoy up to 70% off on your favorite Adarna House books! So come and visit us at our showroom, at at 2/F FSS Building, 20 Scout Tuason corner Scout Castor Streets, Barangay Laging Handa, Quezon City. We are open from 8:00 AM to 5:00 PM, Mondays through Saturdays. Storybooks will go for Php 50.00 each. Call Dang at 372-3548 local 102. Comments Off on Up to 70% off on selected items! Last Saturday, at 10:00 in the morning, almost 100 kids trooped over to the Ortigas Foundation Library. All trips to the library entail reading, of course. But this one was an extra special treat. The kids were there to participate in a Read-Along session of the Philippine Daily Inquirer. And that day, Read-Along chose the life and the works of Dr. Jose Rizal to serve as the central theme, in remembrance of Independence Day. So to start the day, Dyali Justo, an Adarna House storyteller, led the kids in the reading of Dalawang Bayani ng Bansa. The book, written by Rene Villanueva and illustrated by Joel Chua, tells the lives of heroes Rizal and Andres Bonifacio side by side, focusing on the parallels and intersections of their stories. As part of Kuwentong Adarna, each of the kids were given a copy of the book to read from, and take home. The Ortigas Foundation Library suddenly gets all abuzz after the Kuwentong Adarna segment. We find out soon enough that actor Cesar Montano, the day’s celebrity reader, has arrived. Tito Bubuy is best known for his portrayal of our national hero in the movie Jose Rizal and was there to read Si Pagong at si Matsing. The local folk story was first told and illustrated by Rizal on Paz Pardo de Tavera’s guest book in 1886. For this session, Tito Bubuy read our version, retold by Danilo Consumido and illustrated by Hubert Fucio. Saturday’s session, hosted by Junior Inquirer writer Ruth Navarra, was held in Ortigas Foundation Library, which houses an extensive Rizaliana collection. The session also served as one of the culminating activities of Book Matters, a two-month long activity presented by the Library, Lopez Memorial Museum and Library, and Robinson’s Children’s Library. The session also featured the first of six PDI Read Along Kuwentong Adarna segments for the year. In every Kuwentong Adarna segment, one of our storytellers will read to the young participants of the Read-Along session, each of whom will be given a copy of the segment’s featured storybook. We are proud and happy to share PDI’s efforts and passion to promote the love of reading among children. Read the PDI news article about the June 27 Read-Along session here.